Day 13 begins our discussion on horror films of the 1960s, and we’re kicking things off with Roger Corman’s House of Usher. The movie is based on the grim, gothic short story by Edgar Allan Poe, and said story is hella bleak. Fittingly, it stars camp horror legend Vincent Price (House of Wax, The House on Haunted Hill), with whom you are familiar even if you think you’re not. Don’t believe me? Listen to Michael Jackson’s “Thriller” again. That creepy, gravelly voice doing the narration and maniacal laugh at the end belongs to none other than Mr. Price! Here’s the thing about House of Usher, though: it somehow manages to both exceed and fall short of my expectations. Vincent Price is, of course, fantastic as the sinister and hyper-sensitive Roderick Usher– he’s really the main reason to watch this movie. Everyone else…meh. Myrna Fahey as Madeline Usher simply isn’t given enough to do. Her storyline is arguably the most important, but since the tale is largely told from the perspective of her fiancé, she doesn’t even have that many lines. I don’t think she has more than two facial expressions during the first hour of the movie, either (which isn’t a knock on Fahey’s acting, it’s just that for the first few acts, her on-screen purpose seems solely to be embodying a delicate combination of loveliness and rue). Mark Damon, doing his best Ricky Nelson imitation, does have the bee-stung lips and ruffled shirt going on, but even his stylish pompadour and competent axe-wielding prove no match for the evil (and structural deficiency) of the house of Usher. I’ll keep the synopsis short and sweet: Philip Winthrop (Damon) rides all the way from Boston on horseback to spend time with his lady love, Madeline Usher (Fahey). He has never been to her estate before, and upon entering, finds himself immediately accosted by shrouds of gloom and a melodramatic, lute-playing future brother-in-law, Roderick Usher (Price). After much pessimistic hemming and hawing, Usher explains to Winthrop that both he and Madeline are under a terrible family curse, and will be dying any moment now. Their family tree, he intones, contains over 200 years of bad apples that have resulted in some very poor Usher karma indeed. Winthrop is naturally skeptical of this morbid mysticism, but can’t resist being unnerved by the COMPLETELY TERRIFYING paintings in the family portrait gallery. 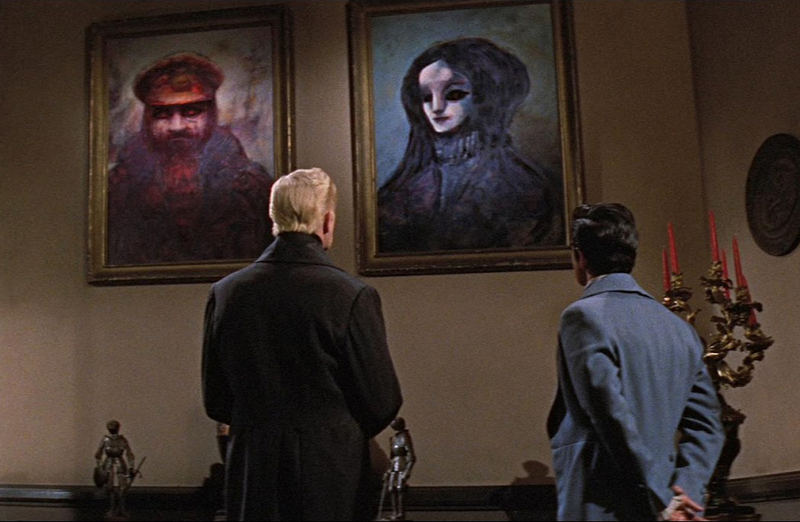 Seriously, I do not know who was tripping on what when these were painted, but wow. Guess I’m not sleeping tonight. Winthrop understandably tries to remove Madeline from the house as soon as possible, but an argument with Roderick over their departure causes her to descend into a catatonic state. Roderick believes her dead (or does he? ), so he quickly and efficiently buries her while still alive (!!) in the family crypt. Once Winthrop discovers this, the rest of the movie is actually quite suspenseful as he frantically tries to find and free Madeline from her sealed coffin. The scares in this film are largely confined to the latter half, but when they deliver, they deliver big-time. House of Usher‘s visuals remind me a bit of Francis Ford Coppola’s 1992 take on Bram Stoker’s Dracula— which is to say that the colors are hyper-saturated times ten, and are practically dripping off the screen. Price wears quite possibly the reddest overcoat ever imagined by man, and everything down to the tiniest minutia seems hellbent on singeing your retinas. It’s kind of cool, but also…ouch. Overall, this film is good but not great. 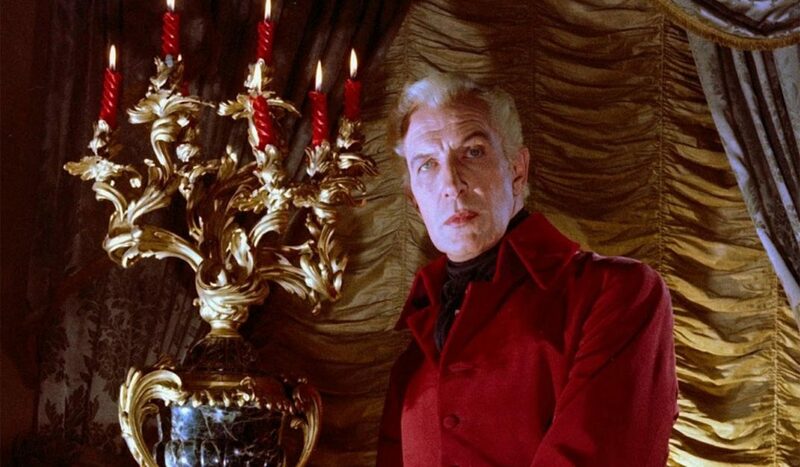 It’s an important entry in Vincent Price’s filmography, and demonstrates why he is so great in classic villainous roles such as these…but does anyone who doesn’t care about Vincent Price really NEED to see it? No, probably not. It’s entertaining, and the last 20 minutes are actually pretty freaky, but it’s a very stylized film that I don’t know will necessarily appeal to all audiences. In other words, if you are already a fan of classic horror, Vincent Price, or the macabre writings of Edgar Allan Poe (or if you’re just a film nerd like we are here at ItsJustAwesome.com), there are plenty of things to enjoy and appreciate about House of Usher. If you’re a newbie looking to get into the genre, however, I do not recommend this as your gateway movie. Tomorrow, Charles will be reviewing one of my favorite “hag horror” flicks: Hush…Hush, Sweet Charlotte (1964). The movie boasts a powerhouse cast in Bette Davis (All About Eve, Now Voyager), Olivia de Havilland (Gone With the Wind, The Heiress), and Joseph Cotten (Citizen Kane, The Third Man). You definitely don’t want to miss this one, so be sure to join us again tomorrow for more 31 Days of Horror! !